✪ Full duplex interphone supports 6 riders in pairing, a host and 5 auxiliaries, After pairing, the host can choose any one of the 5 auxiliaries to talk, 2 riders talking simultaneously. 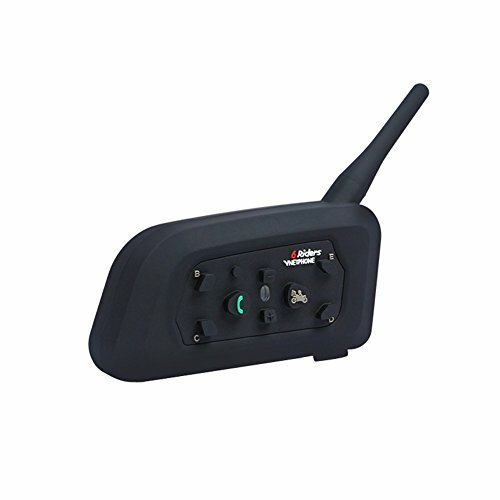 ✪ Bluetooth intercom wireless transmission range can up to 1200m, working speed up to 120km/h. ✪ Automatic switching among bluetooth cell phone, intercom, stereo music. ✪ Enjoy the music through bluetooth enable cell phone, GPS or MP3 stereo music. ✪ More stable structured button panel shows better waterproof performance. ✪ DSP echo cancellation and noise suppression technology ensures crystal clear voice at high speed. ✪ Allows you to answer a call while simultaneously listening to music or the voice prompt of GPS navigations with Audio Multitasking Technology. Communication System 6 Riders: Full duplex interphone support 6 riders connecting, one host and five auxiliaries. After pairing, the host can choose any one of the 5 auxiliaries to talk, 2 riders talking at the same time. Noise Control: Cut down background noise for both incoming and outgoing audio. Bluetooth 3.0 connectivity can listen to and share music, make phone calls with speed dialing, enjoy crystal clear voice and stereo music. Water Resistant: Professional waterproof performance, suit for full weather, don't worry any more when you driving in the light raining day. HFP Hands-free: Handsfree for Bluetooth mobile phone, enable your driving intently and safely. Automatic switching among mobile call, intercom, stereo music. Intercom Range: Works with any Bluetooth equipped mobile phone, GPS or MP3, wireless communication in 6 riders by bluetooth system, 1200m maximum talking range, up to 120Km/h working speed.